Director of Shanghai Ocean University’s Hadal Science and Technology Center (HAST), Lingang (New City), Pudong District, is one of those leading and influencing the development of advanced deep-sea technology. He is on an extraordinary mission to build a fleet of manned and unmanned vehicles capable of routine dives to the bottom of any ocean trench. 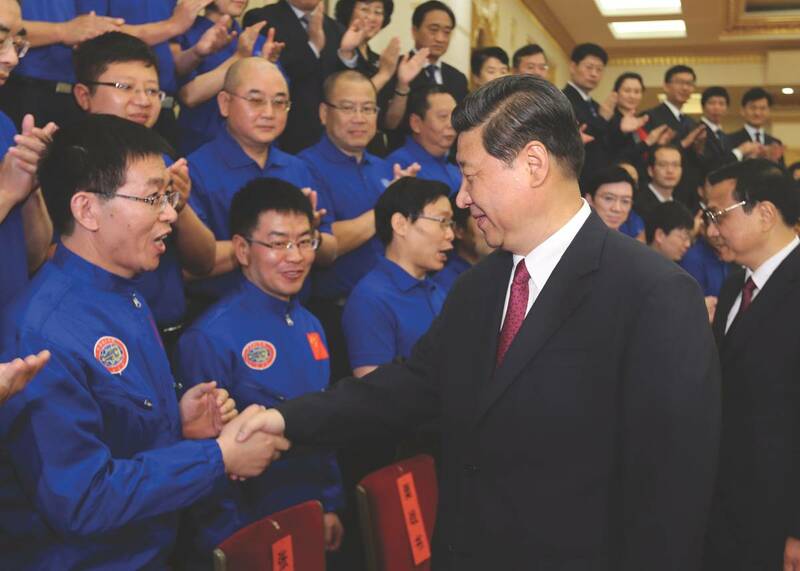 His approach to solving the basic start-up funding problem is likely the first in the Chinese experience, using government-private-public partnerships seen in other parts of the world. He travels extensively and spends many hours meeting with potential and current sponsors from academia, the Chinese national government, the Shanghai government, and private investors, both foreign and domestic. 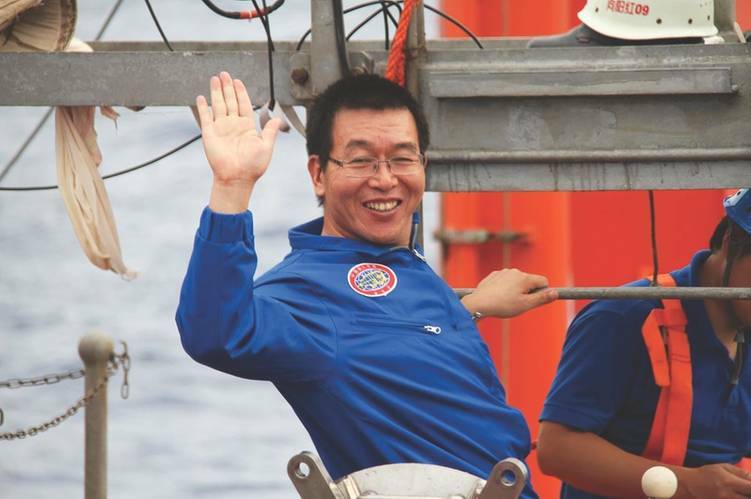 Over the course of his career, Professor Cui was project leader and first deputy chief designer of the 7,000m Jiaolong three-man submersible (HOV), now operated by the National Deep Sea Center, State Oceanic Administration, Quingdao, Shandong province. The Jiaolong has made 151 dives, reaching a record depth for an active submersible program of 7,062m (23,169ft), piloted by Cui himself. Cui has already made test dives of an 11,000m Autonomous Remote Vehicle (ARV), and three different 11,000m Hadal Landers that incorporate both foreign and domestic components. His team is in the process of building two new Generation 2 benthic landers. Cui’s team at HAST has tested a new 4,500m ARGO-like “Floater” using a 17-inch glass sphere for the housing and flotation, with the variable ballast pod on the keel. 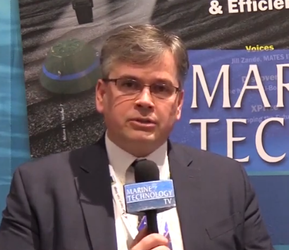 A surface ship can track the “Floater” using a miniaturized USBL system. Production to meet global scientific demand is being considered. In addition to the manned and unmanned vehicles, Professor Cui used his training in ship design to work with Shanghai ship builders to construct two surface support ships for his manned and unmanned vehicles, what Cui refers to as “movable laboratories.” These are the 97 m (318 ft) “RV Zhangjian”, named for the founder of SHOU and launched in 2016, and a smaller SWATH surface support ship RV Shen Gua named for the famous Chinese scientist from the Ming Dynasty who first described the magnetic compass, and launched in June 2018. A third vessel, an ice-hardened mothership has been designed, with no specific plans for construction. Those practiced in the arts will recognize the many difficult engineering challenges that have to be mastered in order to bring these quite different and complex systems on-line. Cui, conscious of his training in both engineering and Buddhism, has done it with gentleness, hard work, inventiveness, and months at sea each year. Cui is driven by an unseen clock, drawn by some distant land, perhaps the sound of internal waves breaking on a hadal shore. His mind keeps working while his body sleeps. Another measure of Cui’s influence is in the work done by his students, whom he guided through their PhDs to develop their natural talents, and his trusted colleagues. His students have brought to operational status a submarine crew Rescue Bell, and a 500m ADS (Advanced Diving System), that functions like a Newtsuit. 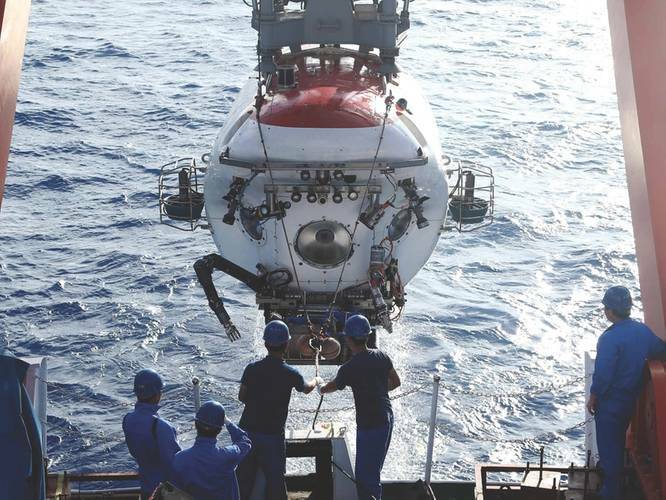 Cui started and passed to colleagues the development of 4,500m manned submersible, named Shen Hai Yong Shi, or Deepsea Warrior. Professor Cui modestly accepts no credit for this work. Cui is currently leading the development of the 11km three-man Rainbowfish submersible. Theoretical and real models of acrylic windows have been tested to destruction, improving his understanding, and offering guidance for revisions to accepted international standards. Likewise, scale model HSS spheres, made in Finland and China, have been tested to destruction in the high-pressure chambers at HAST. These tests have improved understanding of materials and processes that could further change accepted design practice. He has proposed a clever “nested pressure chamber” design, with a personnel sphere inside a first pressure chamber, inside a second pressure chamber, in order to reach hadal pressures with only a 10ksi step in pressure across each of the two pressure chamber walls. Also unique to modern China is Cui’s entrepreneurial technology-transfer mechanism that links HAST with the commercial Rainbowfish Ocean Technology Company. Cui’s college friend, Dr. Wu Xin, is the Rainbowfish Company managing director. 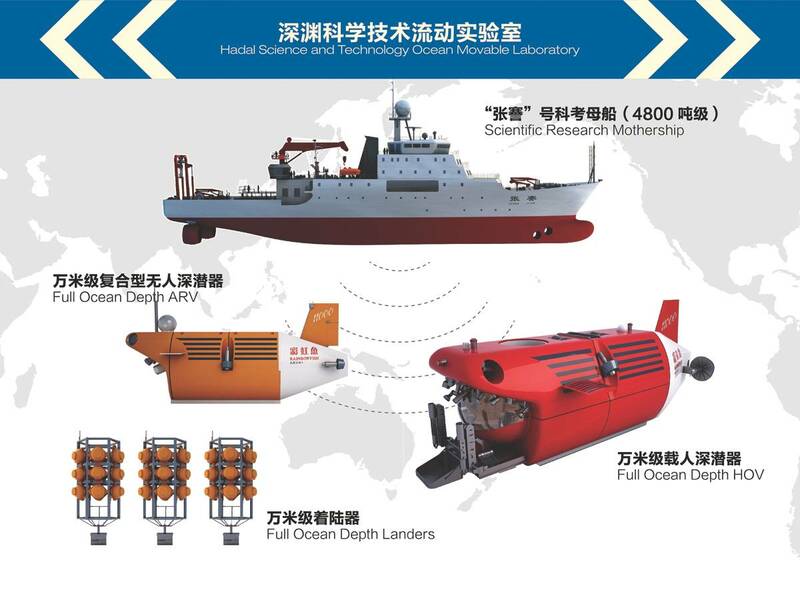 The company plans to charge customers to use its research ship and submarines, and is targeting three groups, said Dr. Wu. “The first is definitely the scientists who are interested in studying deep-sea science and technology. The second group is offshore marine geophysical resource companies, such as offshore oil and seafloor minerals. The last is tourists and adventurers who want to go down themselves to have a look at what’s going on there,” Wu said. Professor Cui said moving away from state-funded research can provide more freedom. Government-funded projects can be bureaucratic and slow, he feels. “I think our government hasn’t found the optimal method to manage large scientific programs just yet. They need to think about this when they are considering the direction of scientific reform,” he said. In implementing their business plan, Rainbowfish has acquired Graham Hawkes’ Deepflight Submarine Company, and is starting production of six new Deepflight tourist submersibles, upgraded from a two-man to a three-man crew. Dr. Wu has negotiated contracts with Five-star hotels in beautiful ocean side locations to operate tourist submarines as a way of raising immediate capital. They will be operated and maintained by Rainbowfish employees. Rainbowfish has also embarked on design and construction of twin four-man 6km rated submersibles, similar to the Russian MIRs, for possible use in China’s mining claim in the Clarion-Clipperton Zone (CCZ) manganese nodule fields. Cui has allocated some of his attention to advising this experienced team as well. Supporting Cui’s imperatives, the Chinese government is building a dedicated pier and breakwater for his large motherships to operate near the Rainbowfish production facility in the port city of Ningbo-Zhoushan. Cui extends his influence in innovative theoretical and engineering approaches to advanced ocean technology by sharing his ideas with PhD candidate students, junior faculty, and now, with Rainbowfish, to employees. With a commitment to global sustainability and academic collaboration, Cui has assembled an advisory board of some of the world’s most preeminent figures in deep ocean science and technology, including Bathyscaph Trieste pilot #1 Dr. Don Walsh, Dr. Sylvia Earle who brings her Ocean Everest advocacy, Russia’s MIR Program Director Dr. Anatoly Sagalevich, DEEPSEA CHALLENGER co-designer and explorer James Cameron, WHOI’s Andy Bowen, Newcastle University’s Dr. Alan Jamison, Scripps Institution’s Dr. Douglas Bartlett, and other distinguished scientists and engineers. In addition to starting the HAST program at Shanghai Ocean University, Cui is advising a start-up group founding Westlake University, the first private university in China. He has been appointed as a chair professor beginning September 1, 2018. “It will be like CalTech in Los Angeles,” Cui said. Both Chinese universities will support the HAST program in the future. Directly, and through his advisors, Cui has invited the world ocean science community to join him in the exploration of the unknown worlds hidden in the depths.